(Reuters) - China's defense minister sought to reassure Asia Pacific neighbors on Sunday that his country's growing economic and military power was not a threat, as long-running maritime disputes in the region flare up again. 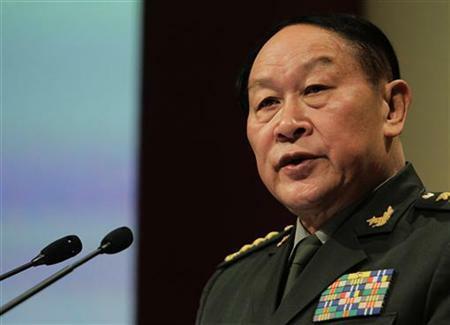 General Liang Guanglie told the annual Shangri-La security conference in Singapore that the modernization of the People's Liberation Army was in line with the country's economic growth and to meet its security requirements. "We do not intend to threaten any country with the modernization of our military force. I know many people tend to believe that with the wealth of China's economy, China will be a military threat," he said, speaking dressed in full military uniform. "I would like to say that it is not our option. We didn't seek to, we are not seeking to and we will not seek hegemony and we will not threaten any country." China will beef up its military budget by 12.7 percent this year, the government announced in March, a return to double-digit spending increases that stirred unease in the region as well as in the United States which has long had a strong presence in the Asia-Pacific region. China's growing military influence has coincided with a more assertive diplomatic tone, evident in rows with Japan and Southeast Asia over disputed islands, and in rows with Washington over trade, the yuan currency and this week over cyber-security after Google said email accounts had been hacked in an attack that appeared to originate from China. But Liang said the situation in the South China Sea where a territorial dispute with Vietnam and the Philippines heated up last month was now stable. "China is committed to maintaining peace and stability in the South China sea," he said adding it stood by a 2002 code of conduct signed with members of the Association of South East Asian Nations to resolve peacefully the rival claims over the resource-rich region. China, Vietnam, the Philippines, Malaysia, Brunei and Taiwan all claim territories in the sea, which covers an important shipping route and is thought to hold untapped oil and gas reserves. China's claim is by far the largest, forming a vast U-shape over most of the sea's 648,000 square miles (1.7 million square km), including the Spratly and Paracel archipelagos. The Philippines said this week that Chinese naval ships and a surveillance vessel placed a buoy and posts near a bank in the part of the South China sea that Manila claims as its territory. The incident happened last month while Liang himself was in Manila on an official tour. Tension also increased with Vietnam last month after Hanoi said a Vietnamese oil and gas exploration ship had its surveying cables cut by Chinese boats. A Vietnamese government minister said on Sunday while the land borders had been settled with China, the dispute over the seas remained. "The land border area has become an area of peace and cooperation for both countries, but it's a different story with the South China Sea," Nguyen Chi Vinh, deputy defense minister, told reporters on the sidelines of the conference. In a rare public protest in Vietnam, up to 300 people shouting "Down with China" marched to the Chinese embassy in the capital, Hanoi, to protest against what they saw as China's violations of Vietnam's sovereignty in the sea. Images posted online showed about 1,000 people marching in what appeared to be a similar protest in Ho Chi Minh City, Vietnam's commercial hub. The modernization of China's navy in particular has raised concern in the region. Beijing is upgrading its destroyers and frigates to sail further and strike harder. China could launch its first aircraft carrier this year, according to Chinese military and political sources, a year earlier than U.S. military analysts had expected, underscoring its growing maritime power and assertiveness. Liang did not touch on the naval modernization, but said the army and the air force remained years behind several of those in the developed world, including those of the United States. "Our army and air force have mainly second-generation weapons. We do not have a large arsenal of third generation weapons or systems while others are entering a fourth generation. So there is a generational gap."